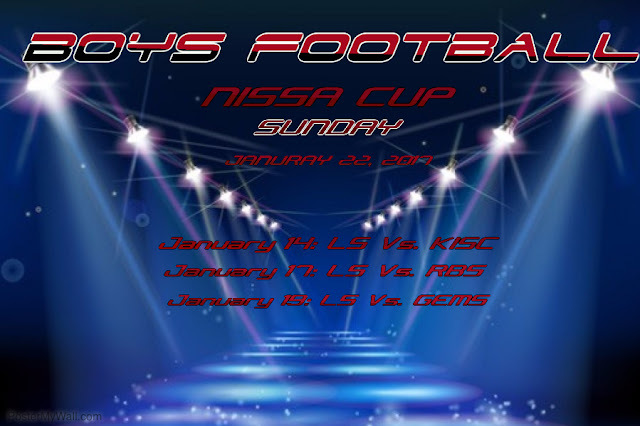 This Sunday, Lincoln School's Varsity Boys' Football team will be taking on the rest of the NISSA schools in the NISSA Boys' Football cup. Our final 3 matches of the league saw the boys win handsomely vs KISC 7-0, before playing out a hard-fought and entertaining draw against Rato Bangala 2-2. Our final game of the league was against GEMS who were already league champions. Despite hitting the woodwork and putting them under some pressure, an own goal in the 2nd half meant that we lost the game 1-0. This meant that we finished 3rd in the league and will take on Rato Bangala once again in the semi-final of the cup competition this Sunday, January 22nd at 9.45. If we win that, we will be playing for the cup a few hours later at 12.45. Come along to support our Snow Leopards at the ANFA ground, Satdobato, this Sunday, January 22nd!